Phoenix Petroleum Treasurer and Head of Corporate Finance Joseph John Ong (rightmost) awards Team Eaglemasters 3 composed of Junie Sotto, Lando Cachuela, Philip Idulsa, Johan Dalmacio, and Ralph Garcia as Team Division champions of the 11th Phoenix Open Golf Tournament held on March 16, 2019 at Rancho Palos Verdes Golf and Country Club, Davao City. 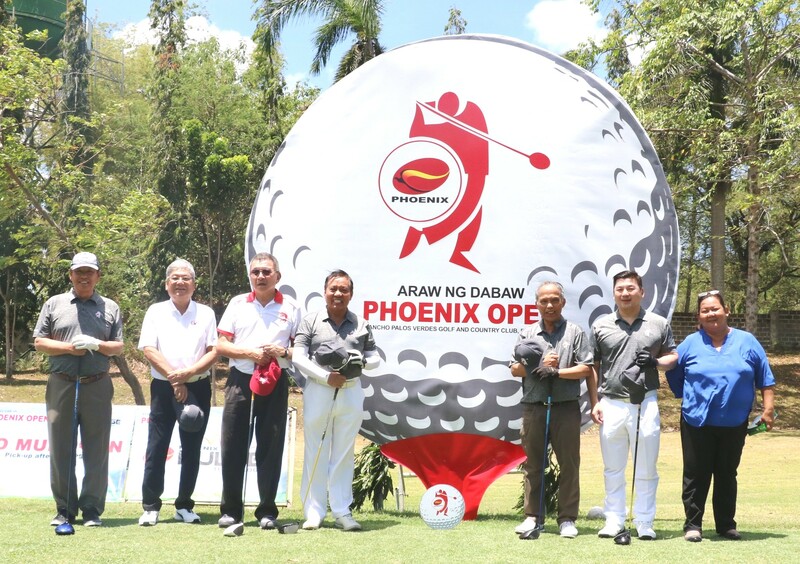 Leading independent and fastest-growing oil company Phoenix Petroleum Philippines held the first leg (for this year) of its annual Phoenix Open at the Rancho Palos Verdes Golf and Country Club in its hometown in Davao City on March 16, 2019. 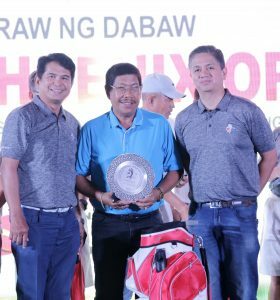 The tournament, now on its 11th year, was attended by over 200 golfers from around the globe led by Phoenix Petroleum President and CEO Dennis Uy. Junie Sotto, Lando Cachuela, Philip Idulsa, Johan Dalmacio, and Ralph Garcia of Team Eaglemasters 3 headed the roster of winners as team champions with a score of 170. Coming in second place are Louie Brodeth, Mayong Pillerin, Ting Castillo, King Rivas, and Andy Ugdoracion of Team Boracuyz (166). Third placers are Wendell Adlao, Jerico Bajo, Jing Tan, Addy Briones, and Brian Davila who made up Team Salami (165). Arnold Navales and Jomari Amador tallied 93 to emerge as champions in the Partner Division, besting the pairs of Isaclolo Diroy and Ferdinand Rondina (82), and Glen Yap and Sherwin Bahani (81), who came in second and third, respectively. Winners Arnold Navales and Jerico Bajo both received their second award of the night when they were hailed Overall Net Champion and Overall Gross Champion, respectively. 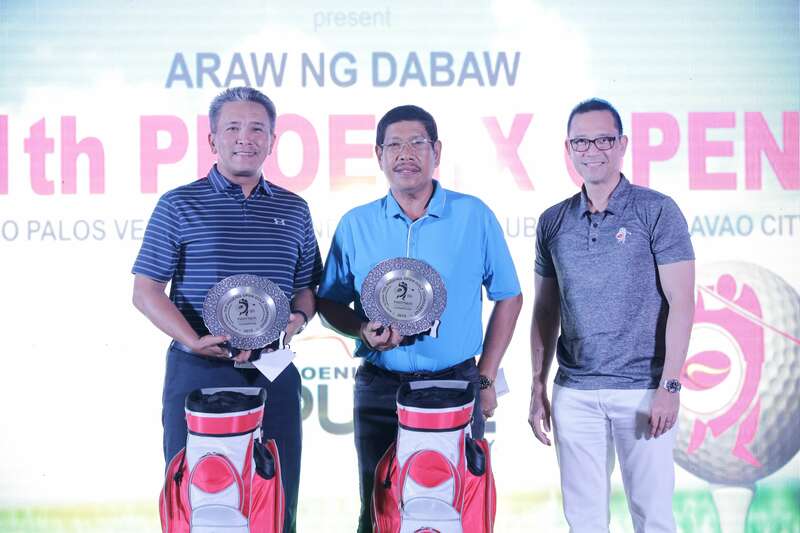 Arnold Navales (center) receives a pewter plate, a Phoenix golf bag, and Phoenix Petroleum fuel cards from Phoenix Petroleum GM for Commercial and Industrial Business Roy Jimenez and GM for Retails Sales Eric Inocencio as overall net champion of the 11th Phoenix Open Golf Tournament. This year’s Individual Division winners were: For Class A, Gross Champion was Roderick Lo, and Gross Runner Up Deo Cura. Net Champion was Wendell Yap while Net Runner Up was Joseph Yun. For Class B, Gross Champion was Jun Pedro, followed by Teodoro Almario as Gross Runner Up. Net Champion was Joe Tesado and Net Runner Up was Benjie Senining. For Class C, Gil Bullecer was named Gross Champion, while John Naranjo was Gross Runner Up. Net Champion was Edwin Ledesma and Net Runner Up John Oberio. For Class D, Don Caballes was declared Gross Champion, while Gross Runner Up was Jip Mascarinas. Ok Hee Park finished as Net Champion, while Antonio Guillen was Net Runner Up. 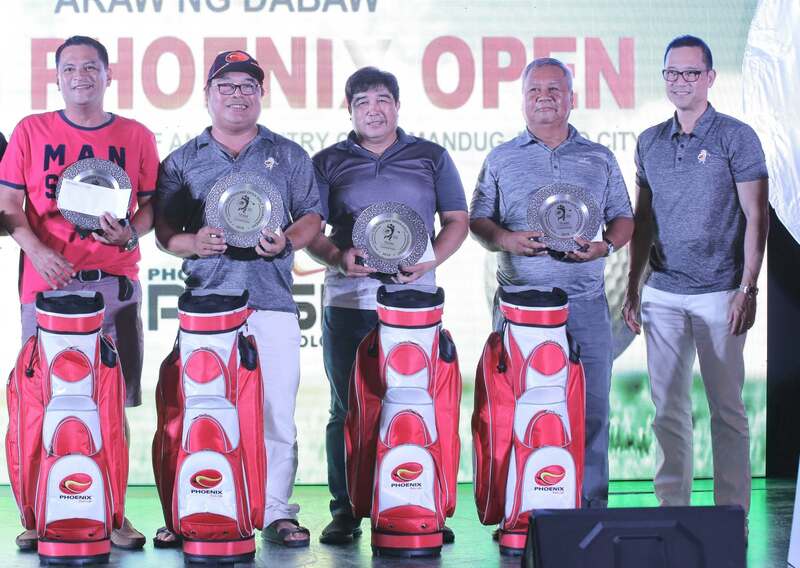 The winners each received a Royal Selangor Pewter Plate and Phoenix Petroleum fuel cards, and the champions each received an additional limited edition Phoenix signature golf bag. The Davao leg of the Phoenix Open is the first of three legs to be held this year, with the next two to be held in June at the Cebu Country Club, and in September at the Country Club, Sta. Rosa, Laguna. Proceeds of the Phoenix Open will be used to fund Phoenix Philippines Foundation’s projects for education, environment, health and safety, and outreach. Phoenix Petroleum President and CEO Dennis Uy (2nd from right) leads the ceremonial tee off of the 11th Phoenix Open Golf Tournament on March 16, 2019 at Rancho Palos Verdes Golf and Country Club. He is joined by, from left, Phoenix Independent Director Minoru Taneda, Phoenix Sales Manager Horacio Ramos, Pioneer Insurance President and CEO David Coyukiat, PNOC President and CEO Admiral Reuben Lista (Ret), Department of Energy Secretary Alfonso Cusi, and Phoenix Open Tournament Director Liloh Evangelista. 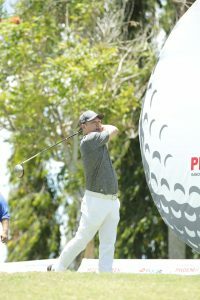 The 11th Phoenix Open Golf Tournament—powered by Phoenix PULSE Technology—is presented by Phoenix Petroleum Philippines, Inc. and Pioneer Insurance, and co-presented by EEI Construction and Marine, Inc., Harley-Davidson, Mechatrends Contractors Corp., Philippine FamilyMart, Tata Motors, and Vitol Asia Pte Ltd..
Cooperator is Banco De Oro. Major sponsors are Charles Monat, Credit Suisse, Measurement and Controls Technology, Trans-Overseas Industrial Corp., and Visayan Surety & Insurance Corp..
Gold sponsors are Chelsea Logistics Corporation, Clark Global Gateway Development Corporation, Food Baskets Corporation, FMC LPG Cylinder, Marra Builders Inc., Maybank ATR Kim Eng, FSC Metal Corp., Clark Global Gateway Development Corp., Monark Equipment Corp., Oleo-Fats Incorporated, Philippine National Bank, Realsoft, ROTAREX, Seadove Maritime Services, Inc., and The Fourth Dimension. Silver sponsors are BPI, BPI Capital Corporation, Kewl Solutions, Nestle Philippines, Universal Robina, and Worthrand Petropower Corp.. Bronze sponsors are Chinabank, Coca-Cola, Development Bank of the Philippines, Ferrotech Steel Corporation, Fruittropic Inc., Japan Tobacco International, KJT Engineering Services, Land Bank of the Philippines, Maybank, Mithras Security Agency, Multinational Investment Bancorporation, Nature Spring, Ohcotech, Penta Capital Investment Corp., PNX UDENNA Insurance Brokers, Inc., RCBC, Servityre, SGS, Simpson’s Phils., Inc., Union Bank of the Philippines, UCPB, and United Overseas Bank.